The mandate of the Central Alberta Regional Trails Society (CARTS) is to promote and foster trail development in Central Alberta. For several years now, CARTS has focussed its efforts on developing the Trans Canada Trail within Central Alberta. Working with dedicated volunteers, municipalities, Alberta TrailNet (ATN - the provincial trails organization) and Trans Canada Trail Foundation (TCT - the national trails organization) we have been making progress. - Through CARTS, Central Alberta's municipalities have been working together on trails. Several years ago, the map for the TCT was changed in Alberta to include a trail linking communities from Penhold to Wetaskiwin. Much of the trail registered as TCT was done so on road rights-of-way with the intention of moving it to an off-road trail. To this end, we have had meetings with members of Alberta Transportation, MLAs, municipal councillors, and members of ATN and TCT. To date, most of the trails between communities and within communities along this corridor have been registered as TCT. - Registering these trails was vital in order to obtain funding available from the TCT Foundation and ATN. - Once Central Alberta had a registered section of TCT, we asked the TCT Foundation to fund a TCT coordinator position to assist our small band of volunteers in moving along the process. This was helpful in the initial planning stages for the TCT in Central Alberta. The total value of this grant was approximately $25,000. We also applied for grant money to pay for engineering studies for two bridges along this section of TCT -- one in Ponoka over the Battle River and one in Lacombe County over the Blindman River. A grant was received in the amount of $68,000 for the engineering studies for both bridges. - We involved all the communities in the planning process. The Town of Ponoka and the County of Lacombe headed up the process of building these two bridges. Since these bridges were part of the TCT, we applied for and received grants totalling $400,000 ($200,000 for each bridge) for their construction from both TCT and ATN. The bridges were constructed in 2010. With the construction of the bridges, one the main goals for CARTS was the construction of trails to connect to the bridges and the communities beyond. 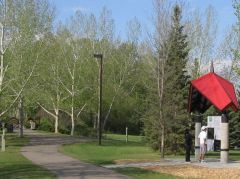 In 2010 and 2011, the Town of Ponoka spearheaded the construction of connecting trail between the Battle River Bridge and the border of the County of Lacombe. CARTS facilitated and supported a funding request for grants for this section of trail and grants in the total amount of $150,000 were obtained from ATN and TCT. This trail was completed to a rough gravel/dirt trail standard. 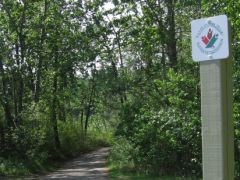 The County of Lacombe completed a connecting trail from Hwy 597 to the Blindman River Bridge including a recreational area beside the bridge in 2010-2011. Much of this trail is to a paved standard. Lacombe County is currently in the process of putting down trail between Blackfalds and Lacombe. CARTS was instrumental in assisting the county in receiving a $288,790 grant for this project. The trail is planned to be to a paved standard with sections of boardwalk and will pass by Lacombe Lake. It is expected that this section of trail will be completed in the late summer or early fall of 2012. CARTS worked for several years with Red Deer County and the communities of Penhold and Springbrook to facilitate the construction of a trail through Red Deer County connecting Penhold and Springbrook. CARTS was instrumental in facilitating and supporting a request for a $50,000 grant to assist with the construction costs of this trail. Unfortunately, the grant has not yet been received, because the trail has not been completed. CARTS is currently working with all concerned parties to work out a plan that will facilitate completion of this trail in the near future. In recent years, CARTS has been making great strides to promote and foster trail development in Central Alberta with the help of its municipal members and volunteers. Since 2006, CARTS has facilitated and supported grant applications to Central Alberta municipalities for trail development totalling more than $920,000. We still have much to do to connect communities in Central Alberta. In recent months CARTS has been working on plans to facilitate future trails connecting to Sylvan Lake, Innisfail, Bowden and Olds. In 2011, meetings were held with the municipalities of Penhold, Innisfail, Olds and Bowden. Penhold, Innisfail and Bowden decided to participate in our organization. In the future, we hope to facilitate feasibility studies looking at trails connecting each of these communities and proceed from there in building those trails to connect to the rest of the Central Alberta Trail network. A Note of Thanks: CARTS appreciates the support of the Trans Canada Trail Foundation and Alberta TrailNet in moving Central Alberta trails forward. CARTS would not exist without the support of dedicated Central Alberta volunteers and the support of the municipalities in Central Alberta. Together we can build something special. CARTS Current Community Participants: City of Red Deer, City of Lacombe, County of Lacombe, Towns of Penhold, Blackfalds, Ponoka, Sylvan Lake, Innisfail, Bowden, and Hamlet of Springbrook.